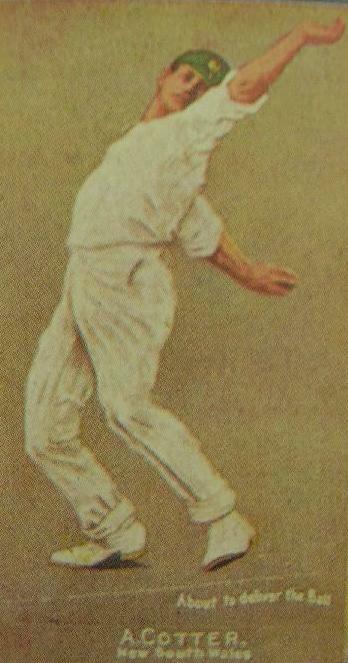 A Rare Coloured Cigarette Card Displaying Cotter's Bowling Action. Headon, D. ed., The Best Ever Australian Sports Writing, 2001, pp. 498-9. When Johnny –‘Won't- Hit-Today’ Douglas comes to write his memoirs, ‘My 97 Years of Cricket at Home and Abroad’, I bet he won’t remember a certain cricket match played on the sands of the Mediterranean coast of Southern Palestine between the British Yeomanry and the Australian Light Horse. Both divisions were having a short rest and clean up on the coast. The Yeomanry, led by Gentlemen from the Very Best Families of England, sent the Light Horse Commander a challenge to a game of cricket. Our scouting parties had seen the Tommy officers sporting themselves in flannels in the cool of the evening. Anyhow, we took them on. Douglas was a Colonel of the Yeomanry, although I never rightly knew whether he was in the Warwicks, the Worcesters, or the Gloucesters. He was always there when it came to a cricket match or a fight according to the Marquis of Queensberry. We had a few sets of cricketing tools bought out of certain regimental funds—never mind whose funds. The desert sand, watered and stamped with tibbin by the Kamleelah wallahs, made a pretty fair concrete pitch. The Yeomanry team, all officers, was a treat to see in spotless flannels. The officers were always punctilious about appearance and cleanliness even in the desert. How they carried their boudoirs about in the desert was a marvel. Our team looked like a mob of Murrumbidgee whalers who had lost their swags. A few of the officers were in khaki slacks and shirts, and the other ranks wore their old blue-grey flannel shirts, riding strides with the knees out for the most part, no leggings, and their knitted socks hanging down over their ankle boots. Our fellows won the toss, and had a bat. They put up only 57, Douglas getting most of the wickets. Then the Yeomanry took block. That's about all they did take. Tibby Cotter, a trooper in the 12th Light Horse Regiment, bowled with the wind behind him, and the Tommy officers never saw which way he went. They just walked in and out in a dazed manner. We had four men behind the stumps to stop any risk of byes getting into double figures. Clive Single, Colonel of our ambulance, bowled from the other end. He had been high in Grade cricket in Sydney and had a good University career—as far as cricket went, anyhow. He bowled a mixed over of slow and medium balls breaking in from both sides. Cotter and Single bowled the Yeomanry all for 4, including one bye. 'Who is this Cotter man?' they kept asking. Douglas had spotted Cotter the first time he made his characteristic long run before bowling, but thought it wise not to break the news to the batsmen beforehand. They took it like sportsmen when they knew. It hardly seemed fair. They squared it off with us later—but that is another story. Poor old Tibby Cotter was given out at Beersheeba later. He was in the front of the mounted charge. The last paragraph is a matter of contention and will be discussed in another post. Cotter was quite a character and his natural larrikan behaviour will become very apparent.